The substrate must be clean, dry and dust free. A render carrier board joint tape must be used on all joints. The insulation is fixed to the substrate using the EWI-225 Premium Basecoat. This is the strongest basecoat-adhesive in the EWI Pro catalogue, offering a long-lasting and secure adhesion. The adhesive is applied to the back of the insulation boards which are then secured to the wall. Mineral Wool insulation easily upgrades the thermal properties of the building, ensuring a reduction in thermal transfer and class A1 fire resistance. Mineral Wool is vapour permeable and also offers acoustic insulating capabilities. Mechanical fixings are used as a secondary method of securing the insulation to the substrate. Stainless steel wood screws with universal fixing discs should be used for Mineral Wool insulation when fixed to sheathing board. The reinforcement layer is applied to the insulation boards and consists of the EWI-225 Premium Basecoat. The reinforcement layer creates a smooth surface before applying the render. EWI Pro offer a range of coloured renders, all of which can enhance the external appearance of the property. Each render provides a long-lasting, crack-proof finish and come with a range of advantages for the building structure. 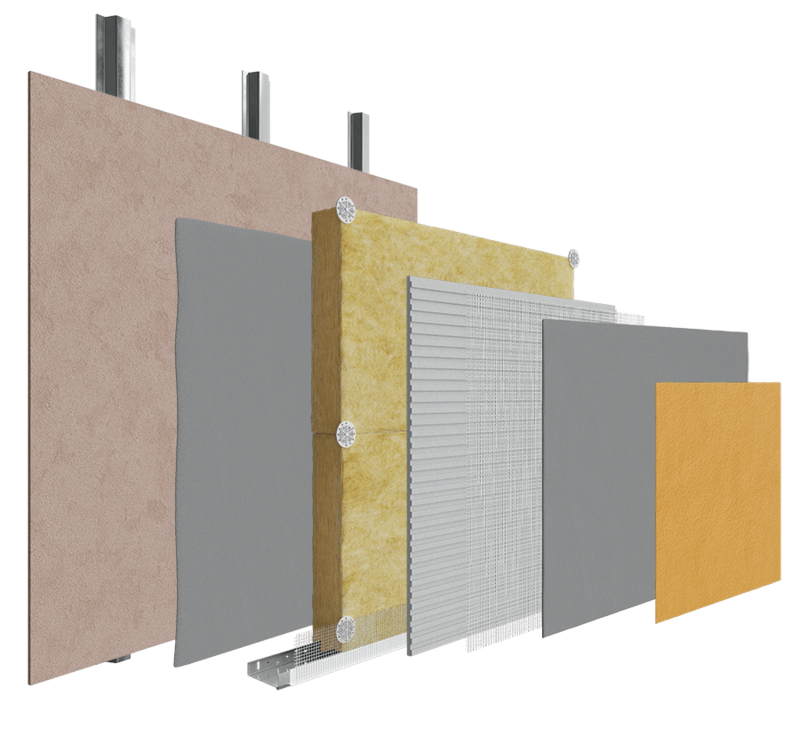 Our Mineral Wool insulation system are highly versatile as a result are suitable for a broad range of substrates, including sheathing board for a particularly durable system. Use Premium Basecoat and wood screws with Universal Fixing Discs to secure the insulation to the substrate, and finish off with breathable coloured render system such as our Silicone Silicate Render.